Two Book Friday is here!!!!! First this week we have a basketball book for beginners. This easy to read book teaches the basic phrases and terms associated with basketball and it also has some great pictures. This week, the little one informed me that Grandma was her best friend, so with that in mind the second book is I Really Want to See You, Grandma. 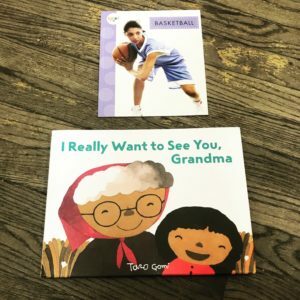 This is a hilarious book about a child and her Grandma who keep trying to visit each other but miss each other at every turn. The little girl rides a scooter just like our little one, however in the book Grandma rides a motorcycle whereas our Grandma takes the train. Happy Friday!